As the days grow longer and the garden wakes up after its Midwinter rest, we start again …welcoming friends old and new, and enjoying this cycle of sowing and growing. If you are interested please get in touch, we would love to hear from you! If you would like to know more, please Contact Sharon. When: During term-time we meet on Wednesdays 09.45 – 11.45. From the first of May, you will be able to pop in to the pavilion for a refreshing cuppa from the Paddock Pop-up Cafe! NEW! Twilight Time: As days lengthen and warm, what better way to end the slump of mid-week Wednesday, that than by spending an hour or two at Vine Road or in the Orchard? Sharon is trialling a series of six twilight community sessions 5th June – 10th July. All are most welcome. Pop in, come just once, make it a regular thing, come alone, bring the kids, bring your ideas and your enthusiasm…but do come! 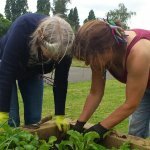 Final food for thought: Are you on an allotment waiting list? Have you thought about adopting one of our raised beds as your own?